I grew up passionate about food. 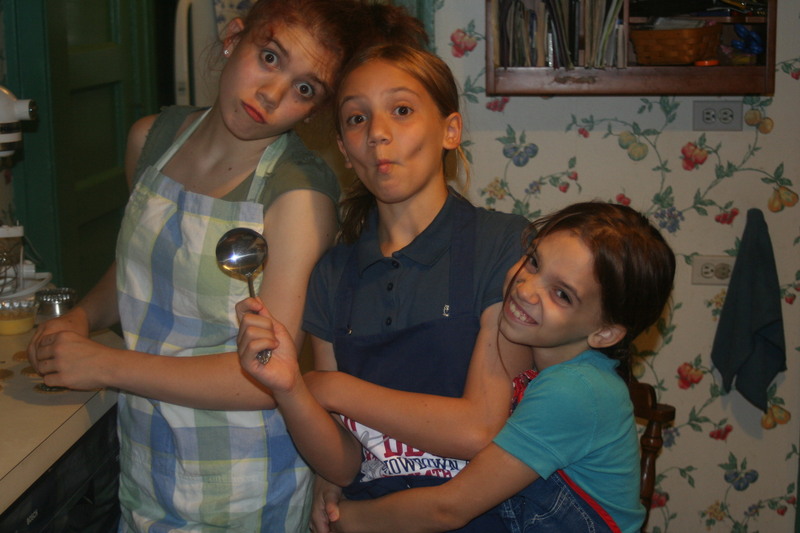 But it’s only been in recent years that I’ve realized how frequently and how well my family cooks. A home cooked meal has always been a given in my life. Because it’s just what we Wilkeses do. We cook. We take our cooking very seriously. I think cooking plays such an integral role in our lives because we actively place value on our food. My family is a quiet bunch, but we have a knack for flavor. So even when it comes to the simplest dishes, we know how to make them special. We’re “good at food”. And when you’re good at something, you just keep doing it and eventually start sharing it with everyone else around you. It sounds so simple, but food has greatly shaped the way my family functions. To further explain: think of the well-known five love languages (Giving, Quality Time, Words of Affirmation, Acts of Service, and Touch). Our love language is giving. Giving food that is. 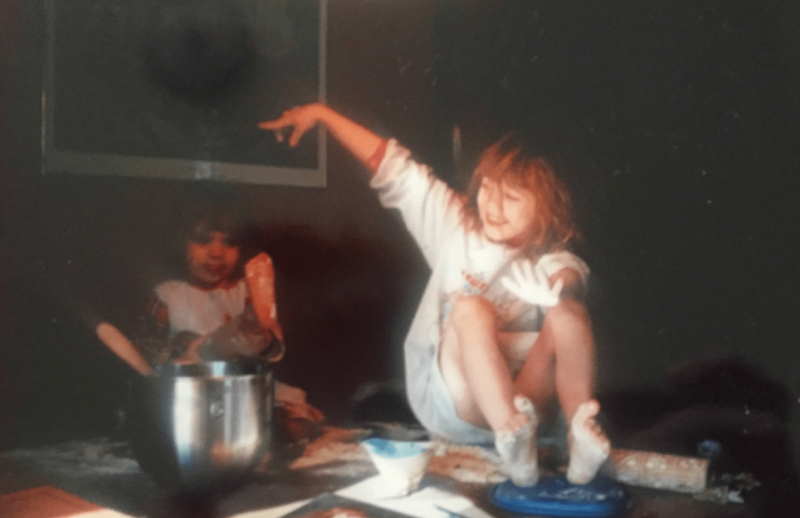 I quickly picked up being “good at food” and according to family stories started cooking various dishes at a young age. Except back then, these “dishes” were actually called “concoctions”, since they weren’t quite edible yet. But graduating past my pre-school years, I eventually started getting a bit more experience in what was edible and what was not. And god knows what these concoctions contained. I can’t exactly pinpoint the moment in my life when I started cooking. I just know that I always have. I experimented with and created my own cake recipes. I tried numerous combinations of homemade sauces on my spaghetti. I stayed up late making the perfect lunch for school (whole-wheat bread sandwich with spiced turkey, spinach, jalapeño cheese, chipotle mayonnaise, and pesto, thank you very much). And through all of this, I cultivated for myself a distinct particularity when it comes to taste. I still consider myself an avid foodie, cooking frequently and with much delight. Eventually, in my freshman year of high school, I decided to start my own cake business. My inspiration wasn’t glamorous. I was simply bored in high school and needed another activity. So I just continued with something that I already knew well: Cooking. But I wanted something a little more challenging than just cooking, which is why I gravitated towards baking in particular. Few people realize this, but baking is a much more delicate and specific art than cooking. In cooking, a mistake can be fixed or covered up with other ingredients. But in baking, one mistake could ruin an entire piece. It poses more of a challenge to the baker, and it is one that must be artistically conquered. I’ve always been particularly drawn towards hands-on art. And in my mind, baking was just another facet of this genre of art. Sugar comes in a fascinating array of forms, just like art comes in a wide array of mediums. Sugar is fascinating. And I wanted to explore it more. So I picked up a few cake decorating books and did a little online research and started teaching myself about all these forms of sugar. I did not start with much confidence, since I was measuring myself against work of experts (it’s a bad habit I have). So I began by donating cakes to local events. They weren’t good enough for me to start charging money for them (and at this point, the thought of charging money had not even crossed my mind). But I felt comfortable offering my baking services to friends and family I already knew. I started small with simple birthday cakes. They are easier because they are typically only one or two layers, so I didn’t have to factor in the weight and density of the cake. They don’t require advanced aspects of construction like dowels, plates, or sometimes even changing the recipe of the cake to make sure it stands steady. Also, the “canvas” is smaller, so not as much forethought has to go into design. One simple decorating technique tends to hold its own in a smaller space. My first major cake was a Mardi Gras themed cake for my church. Now I normally don’t mind posting some of my beginning pieces online. I think it’s a good way to documenting the progress I’ve made. 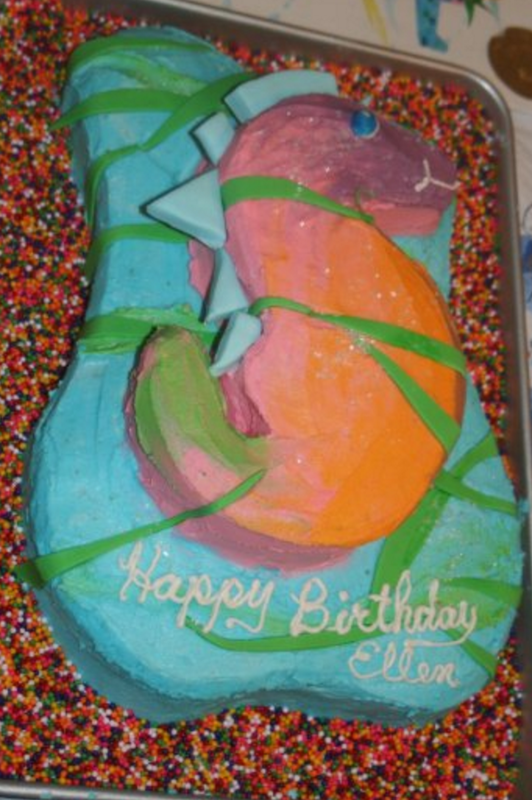 But you’ll notice that I did not include a picture of this cake in my official gallery. I just can’t. For me, it’s like that first official essay you’ve ever written. It took so many hours and you were so proud of it once you were done. But looking back, years later, you can barely read through the whole essay without shuddering. It’s awful. And that’s what this cake is like for me. I shudder when I look at old photos of it. 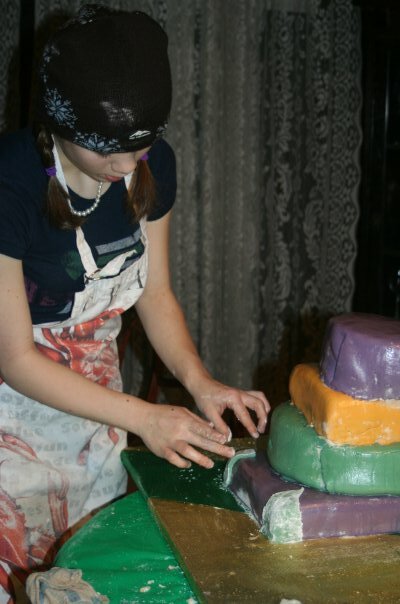 Still, I was making four tiered cakes with multiple layers of fondant and intermediate level sculptures. I just hadn’t fine tuned my decorating skills or learned enough about how to combine these multiple mediums into a cohesive and beautiful cake. But it was a start. After a few more donation cakes (including my first wedding cake!) I was finally asked if I would start charging money for my cakes. I was honored. And surprised. And since cake decorating can quickly become an expensive hobby (when left just as a hobby), I accepted. I gave my business a name: “Cakes by Katie”. I created a business cards and started reaching out to local organizations and scholarships for support. It didn’t take long for things to pick up speed to the point where I would be selling a couple cakes a month. With this new rise in demand, I decided to dedicate more time to perfecting the art. I signed up for local baking and decorating classes. These classes were somewhat helpful, but I often felt like I needed something more advanced. 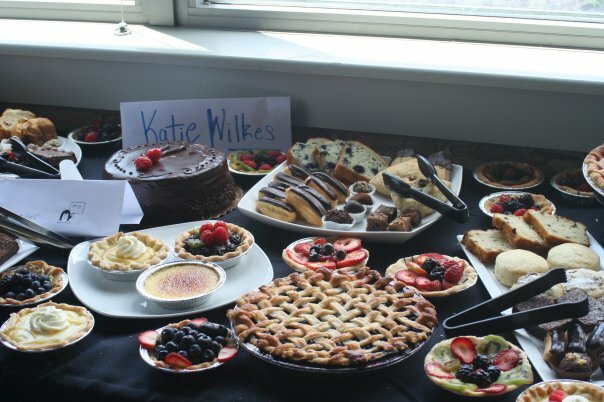 So I started looking into actual classes at local Culinary Institutes, which is how I discovered Kendall College’s “Summer Baking and Pastry Camp” and Wilton’s School of Baking and Decoration. And for the next couple years, I signed up for as many of these advanced courses as possible. I have since completed the Fondant, Gumpaste Flowers, and Sugar Pulling Summer Programs at Wilton School as well as the Beginner’s Baking and Pastry Summer Program and Advanced Baking and Pastry Summer Program at Kendall College. These classes taught me how to be consistent in my art. They also taught me how to be patient. I was required to practice the same piping techniques until they were mastered. I learned how to make designs as intricate as Baroque detail. I developed a keen awareness of how the exact amount of sifted ingredients can define the different between a perfectly elastic dough and a tough one. These were the ultimate courses in fine-tuning. I learned many recipes, ranging from simple Italian Buttercream and a basic Pate Sucree to the more advanced Galette de Rois Pithivier, Chocolate Génoise, and Sacher Sponge Cake. But most importantly I learned dedication and consistency. I learned how to act smoothly in a hectic kitchen while still producing good work. I learned how and why I loved this art so much. When someone places and order with a design in mind, it is my job to produce their vision in an artistic and functional fashion. It is a multi-dimensional challenge. It keeps me on my toes and demands only my best. I love baking, pastry, cake decorating, and I loved having my high-school business. It challenges my mind in many ways, and I absolutely plan on keeping it as a lifelong hobby.